For the EZ-RJ45 crimp tools, see parts 115 3212 and 115 3213. 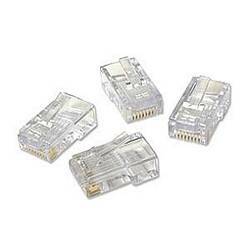 Designed for the EZ-RJ45 Crimp Tools, these 8P8C connectors let you build perfect network cables every time. The wires are inserted through the connector for easy verification of the wire sequence. In this way, the wires are always lined up for perfect contact with the connectors.